Cultural activities including a traditional Chinese Tea ceremony. Complimentary hot tea is included with the meal. A cash bar will also be available. Because seating is limited, online reservations are preferred. Single tickets are $40; bring a companion and receive a $5 discount. Tickets are available on our secure site at Network for Good. Guess Who’s Coming to Dinner is an annual, year-round fundraising initiative that supports expenses for CultureALL’s ongoing education programs. These interactive, multi-cultural learning experiences touch the lives of thousands of K-12 students each year in Central Iowa schools and community programs like Boys & Girls Clubs. CultureALL helps young people develop the social and emotional skills they need to appreciate global cultures, understand multiple perspective, communicate effectively, and build relationships across cultures. 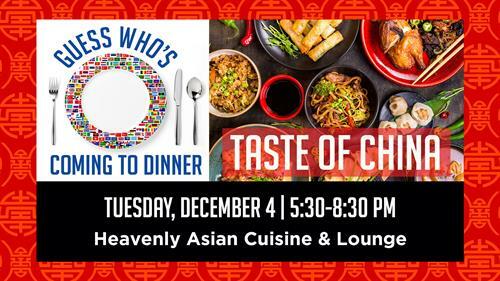 By purchasing a ticket to attend Taste of China, you’ll be helping to prepares Iowa kids to live, work, and thrive as members of a diverse, global community where everyone is valued. Our signature sponsor for this event is Kemin Industries. Other Guess Who’s Coming to Dinner sponsors this season include Aureon, Bankers Trust, Bank of the West, Hardin & Associates, Prairie Meadows, and Wells Fargo.